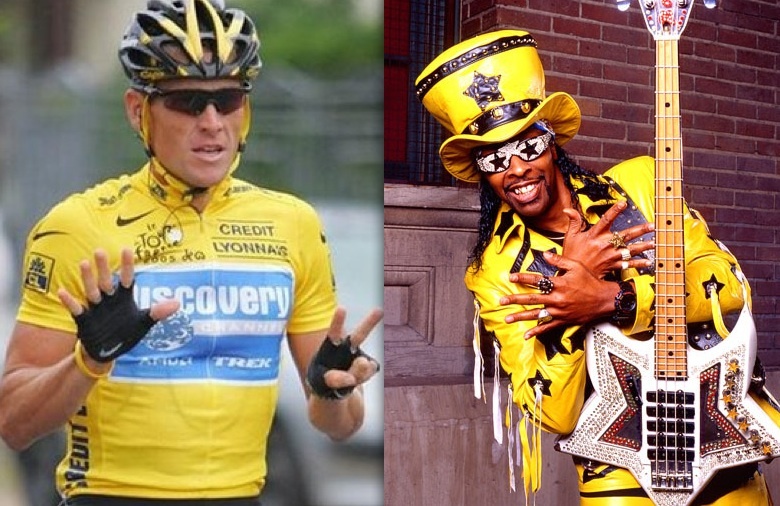 Bootsy Collins and Lance Armstrong. Closer than you think. When Twisted Spoke signed up for twitter we were given the option of following some famous people right away. The starter celeb kit. Cycling being our particular obsession, we naturally chose Lance Armstrong. But there was another name on the list of possibilities that caught our eye: the funkster himself Bootsy Collins. We couldn’t resist the comedy in following just two people with such contrasting personalities as the 7 time Tour de France winner and the bass player for James Brown and later the genius behind arguably the greatest party band of all time, Parliment Funkadelic. The JB connection. Lance Armstrong toured the world and rode for master tactician Johan Bruyneel while Bootsy toured the world and played for groove-king James Brown. When Booty formed his Rubber Band, he brought in the Horny Horns. Lance is a big fan of the Texas Longhorns. Bootsy hob-knobs with fellow funkateer George Clinton while Armstrong has hung out with ex-president Bill Clinton. Bootsy has been at the top of the R&B charts many times and Lance is usually at the top of the UCI charts. Collins has several alter egos including Casper the Funky Ghost and Bootzilla — “the world’s only rhinestone rockstar monster of a doll.” Lance is known to some as Mellow Johnny, The Boss and Juan Pelota. Bootsy did a TV commercial for the Motorola ROKR phone. Armstrong is sponsored by major cell phone re-seller Radio Shack. Collins has his a signature Bootsy Collins model bass called the “Bootzilla” made by Traben. As cycling fans know, Trek makes a special time trial bike just for Armstrong. Bootsy served as “Heineken’s Amsterdam 2005” curator and master of ceremonies. Lance is of course a Michelob Ultra pitchman. Parliment Funkadelic was THE dominant funk outfit in the world in the 70’s. US Postal was THE dominant cycling squad from ’99 to 2004. In 1997 Bootsy was inducted into the Rock ‘n’ Roll Hall of Fame. When Armstrong does retire for good he’s a lock for the Bicycling Hall of Fame. Bootsy survived 11 months playing with the volatile and violent James Brown. Not to be outdone, Armstrong survived cancer. Bootsy claims to be the “P-Master of the Universe” and has a legion of “funkaholics.” Armstrong is the most famous cyclist on the planet with an army of followers. Allegations of drug use surround both Bootsy and Lance — however Bootsy is happy to report that yeah, he was funked up most of the time. Bootsy has a crazy yellow suit and hat for stage shows. Armstrong has a closet full of yellow jerseys from the Tour de France. Bootsy contributed to the movie soundtrack for Superbad and Armstrong did a cameo in Dodgeball. In some deep, cosmic sense, Bootsy and Lance are soul brothers, separated at birth. One is funky and the other is hyper fit. In their own way, they’re both freak-azoids, baby. « Bruyneel hooked. Still casting for Armstrong. A twitterific day for Twisted Spoke. interesting observation. I wonder if Lance has funk. I love the blog title troubledtherapist. Gonna have to check in on you. Yes, Lance has the funk. Haven’t you ever seen him dance on the pedals?